An internship report is a document that reviews your experience at a company as an intern. Completing an internship is considered by your evaluators as a decisive step in your education, and as such, your report must put forth all that you have learned during the experience. Here are some ideas to help you to prepare your internship report. Keeping a task list during your internship will help you to list the work that you have completed at the company. You can add these notes from this list to your internship report and save yourself time in recalling each task, especially if some time has passed since you have completed them. Your recollection of the information regarding the task will also be more accurate. On average, an internship report is around thirty pages. For a short internship (less than 15 days in one month), around 15 pages will suffice. The required length may vary depending on your school's requirements and could even go up to 80 pages. This information will be provided by your supervisor. There is no single format to follow, but you can use the following standard format to guide you when writing your report. Your report should include the following elements: a cover page and a content index. The cover page should display your first and last name, the job title, the dates of the internship, and the name of the company. It should also include contact information for your university and the name of your internship supervisor. The content index can be in two or three parts, with an introduction and a conclusion. Each part contains several numbered sections (e.g. 1 > 1.1 > 1.2, etc.). For example, you should start with your introduction, where you provide the context of your internship. You should follow with a summary, or an overview of your experience and work that allows your school to judge your internship experience. Next up is a company description, which outlines the sector, offered services, market, internal organisation, etc. of the company in which you completed your internship. Now, you should get into a description of your experience, including tasks completed, tools used, skills gained, etc. Finally, your conclusion should describe the internship in the context of your educational program. You should explain the skills that you have gained and try to highlight the value of your having completed the internship. Optional items include an appendix (for graphs and tables), a glossary (i.e. technical terms used), and a bibliography (for books and articles mentioned in the report). 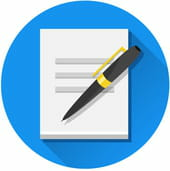 The writing style of an internship report generally consists of short and simple sentences to underline the value of the experience without overcomplicating things. You should also be sure to include a bibliography to properly cite your sources. For the format of the report, use a standard font and size, such as 12-point Times New Roman or 11-point Arial. The section titles should be bold and in a larger size, for example 16-point Arial. The paragraph titles should be bolded and in a slightly larger font size, for example 13-point Arial. The correct spacing is generally 1.5, however, this could vary depending on your assignment and your school. Published by Daniel Telele. Latest update on April 25, 2018 at 12:11 PM by Israel Ayala. This document, titled "How To Write an Internship Report," is available under the Creative Commons license. Any copy, reuse, or modification of the content should be sufficiently credited to CCM (https://ccm.net/).